SasView is currently building on 32 bit. However with the move to Wx3.0 it should be possible to build in 64 bit. Make sure at least to download all 32 or all 64 bit packages. The instructions below make use of the python distribution from python.org. We are in the process of assessing a move to anaconda as the preferred developer distribution. If you want to try that out, see [AnacondaSetup?]. If the correct version isn't displayed then it's probably not set as an environmental variable. These can be changed in My Computer ‣ Properties ‣ Advanced ‣ Environment Variables The directory where python is located should be entered under 'PATH' and 'PYTHONPATH'. If this doesn't work then a temporary fix is setting the path on the command line. An example of this is below. Some packages don't come in a friendly .exe file. To install these you will have to use the command terminal. There are two examples below of how to install. (The example installs periodictable using Python 2.7). To obtain the source code you need to have git running. if you haven't already got it, it can be obtained from ​github. Alternatively one can install git with a GUI. A good one can be obtained from ​tortoise. Note: You may get an error saying "Error: Python was built with Visual Studio 2003; extensions must be built with a compiler that can generate compatible binaries". To solve this issue we recommend using Cygwin and to compile with MinGW32. The best thing about this is that you don't have to actually use Cygwin. First go to the download page of MinGW and download the latest version. ​https://sourceforge.net/projects/mingw/files/ (Making sure it's 32-bit or 64 bit compatible depending on your setup). Next make sure the PATH variable is set to the folder containing the MinGW32 GCC. (Usually found in 'C:\MinGW\bin'). Next enter the following into the command terminal. Installing is straight forward. Use a similar approach to building SasView by using the code below. Use the following command to run SasView. 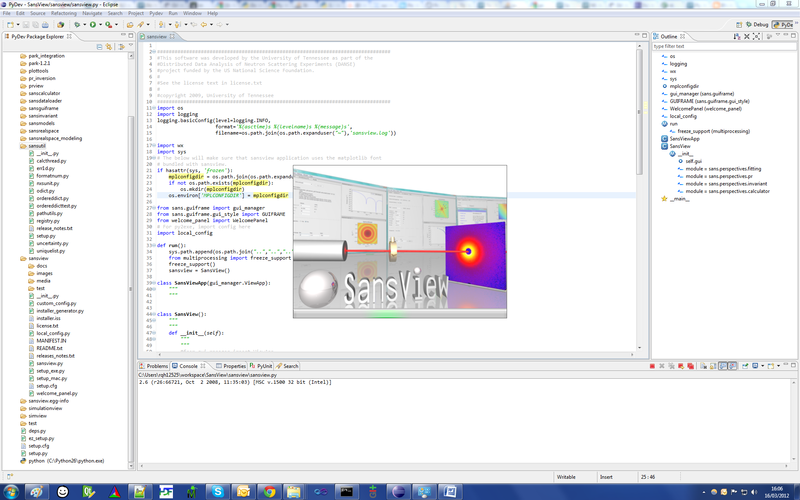 (Make sure you are in the directory where sasview.py is located). Note: If you get a similar error to the one below then make sure the PATH's contain where to find the modules. This is usually the trunk folder in C:\sasview. This section is optional, if you want to use an IDE like ​Eclipse and not a text editor like ​Vim then carry on reading. Read the instruction on how I did it below or follow this simple ​guide by Pete Jemian. Once these are installed load up Eclipse. 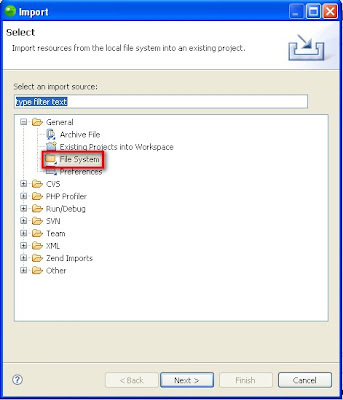 It will ask for a workspace directory to store the project files in, you can choose anywhere. Make sure that you are in PyDev mode. You can see this in the top right corner of Eclipse. Setup a new project. File ‣ New ‣ PyDev Project. Name it something sensible like SasView? Project. Leave all options as default but make sure the option "Create 'src' folder and add it to the PYTHONPATH" is selected. Select the directory where your files are located and the input Folder, and click finish. Add the directory where the external packages are stored to the PyDev settings. Window ‣ Preferences ‣ PyDev ‣ Interpreter-Python ‣ Libraries ‣ New Folder. If you still have errors with wxPython then remove your interpreter and add it again. After a restart of Eclipse the errors should have disappeared. Finally right click on the project, properties and then change the PyDev PYTHONPATH so that it contains the build directory. This is needed for debugging purposes. Open sansview.py and hit the run button.